Not since 2007 have American CEOs held a rosier net view of the near-term future. The biggest potential hiccup CEOs see? “Geopolitical craziness that would shut down entire markets to us if people get nervous,” said Bob Paul, CEO of Compuware. 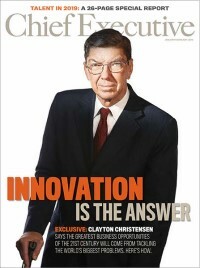 Annually, Chief Executive magazine talks with a handful of CEOs, diversified by size, industry and geography, about their outlooks. This year’s group includes a wide swath of notable consumer and business-to-business companies. We asked them three questions: What is in your crystal ball for your company and your industry for the year ahead? What is your outlook for the U.S. and global economies? And what issue or challenge are you most concerned about? Here are synopses of what they said. shopping and GDP plummeted last winter because of poor weather, we should see the benefit in the first quarter in terms of relative performance. We’ll benefit from some general lifts. Our home business right now is pretty strong. Gasoline prices have been falling on a relative basis, and that frees up money and helps consumer spending. But the retailing business is evolving; and in the department-store sector, the influence of e-commerce and the Internet is very strong. So we’re initiating an “omni-channel” initiative called “Let us find it,” [so that] when a customer is in our store and wants an item, we’ll find it via Internet from anywhere within our store footprint or e-commerce and get it to her. Plus, everyone is competition now, not just department stores. So, we have to be very aggressive in terms of wooing and holding on to our consumer and making it exciting to shop in our stores. Headquartered in Milwaukee and York, Pennsylvania, the company operates 273 stores in 26 states and had fiscal-2013 revenues of $2.8 billion.